Oakland will break ground after more than a decade of planning. Master developer SunCal will start construction on Oak Knoll, 918-home community on the 183-acre site of a former naval hospital. The development will also include 80,000 square feet of retail uses in a village center and 84 acres of public parks, open space and trails. The first homes in Oak Knoll will take a couple of years to hit the market. SunCal plans to build out the “pads” that it will sell to homebuilders in a year or two. “A master development of this size can take 10 or more years to build out,” said Joe Aguirre, a SunCal spokesperson. Oak Knoll, designed by Hart Howerton, includes a mix of for-sale townhomes and single-family homes. The site, at Mountain Boulevard and Keller Avenue, is the second-largest single active development in Oakland after the 3,100-unit Brooklyn Basin project from Signature Development. Housing development is booming in Oakland with several thousand new homes under construction, but the vast majority are apartments and not for sale. Home prices more than quadrupled in Oakland to a median of $710,000 in June since hitting a low of $152,000 in 2009, according to real estate information company Zillow. Getting to a groundbreaking proved to be a complicated journey for SunCal. 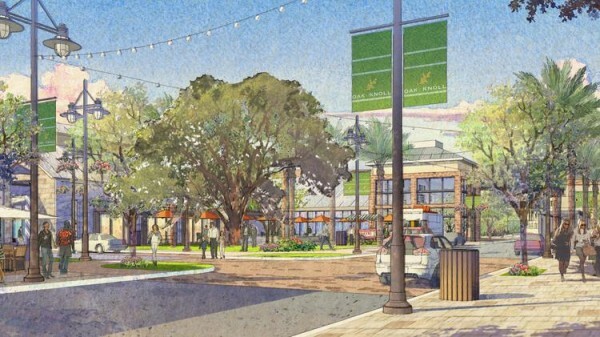 Development plans for Oak Knoll date back to 2005, when Irvine-based SunCal first bought the site for $100.5 million with the now-defunct investment bank Lehman Brothers. The developer came up with a design for 960 homes before the Great Recession hit in 2008 and Lehman declared bankruptcy. SunCal lost control of the site after the bankruptcy. At one point, a holding company for former Lehman-owned properties brought on Signature Development to revive the project. SunCal then re-entered the picture and reacquired the site in 2014. After revising the design, the developer secured city approvals in November finally allowing them to move forward. The developer faced some blowback from labor unions that wanted SunCal to guarantee the homes in Oak Knoll would be built by union workers. SunCal agreed to consider union labor for the site preparation, but homebuilders will decide later if they will use union labor or not.